Love is in the air since tomorrow will be Valentine's day. I asked my husband if we can just go out and have a date on 15th or 16th since I know traffic will be horrendous tomorrow (not to mention that it's a payday). 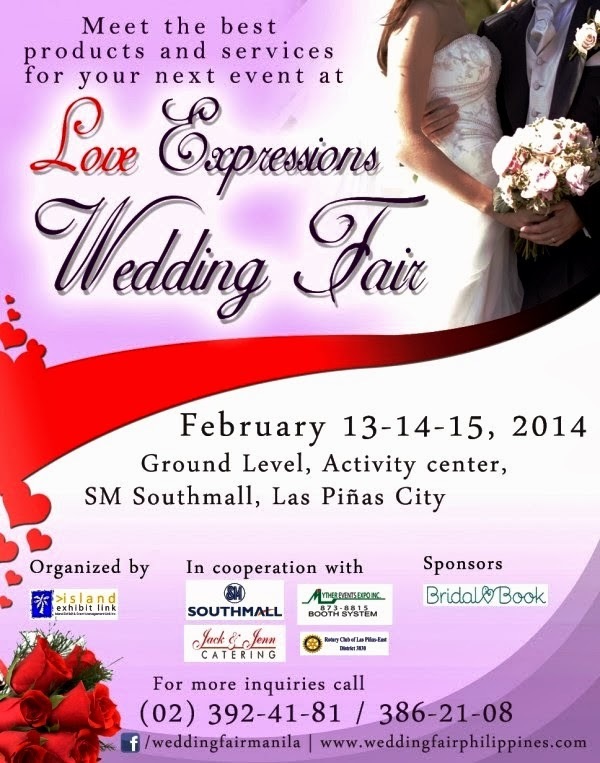 For soon-to-wed couples who are from the South you might want to check out Love Expressions Wedding Fair @ SM Southmall Feb 13-14-15, 2014. It's either I'm staying inside my house far too long or my memory is right but this is the first time that SM Southmall is having a bridal fair event. Correct me if I'm wrong. Discover the best suppliers and event partners for your special day on this wedding fair at the Ground Level Activity Center, SM Southmall Las Pinas. Isn't it sweet and lovely that you will be having a date in a wedding fair in preparation to forever. So romantic! Apart from the wedding suppliers and discounts that you can avail once you've made a reservation, enjoy talks on Love Languages, Dating and Relationships, Budgeting for Wedding by Bro. Mond and Leigh de Armas of Alabang New Life Christian Center. What's more you can get tips on How to Plan your wedding and How to be a Professional Host and Emcee by Jenne Rabe of Jack & Jenn Catering. To spice up the event, be entertained with performances by NTUNE Acoustic Band, Heart and Soul Quartet, A Band, Symphony of Strings, Amaya and many more. PLUS! on February 14, 2014 at 5:00 PM watch the Fashion Show featuring the fabulous up and coming designers, Marco and Oyama and White Label Bridal. Here's the part that I love the most when attending bridal and wedding fairs, BOOK ANY OF THE SUPPLIERS AND RECEIVE A FREE GIFT FROM THE ORGANIZER plus GET A CHANCE TO WIN YOUR WEDDING SUPPLIER. Celebrate love, celebrate romance, celebrate forever at the Love Expressions Wedding Fair. "Love Expressions Wedding Fair is presented by SM Southmall, together with Jack & Jenn Catering, Rotary Club of Las Pinas East and Myther Events and Expo Inc. This event is sponsored by Booms Audio Sounds and Lights, Dermaesthetic, Gems by Me with Online Media Sponsors Bridal Book.ph, Weddingsupplires.ph, HalloHalloTown.com, and organized by Island Exhibit Events Management Inc".